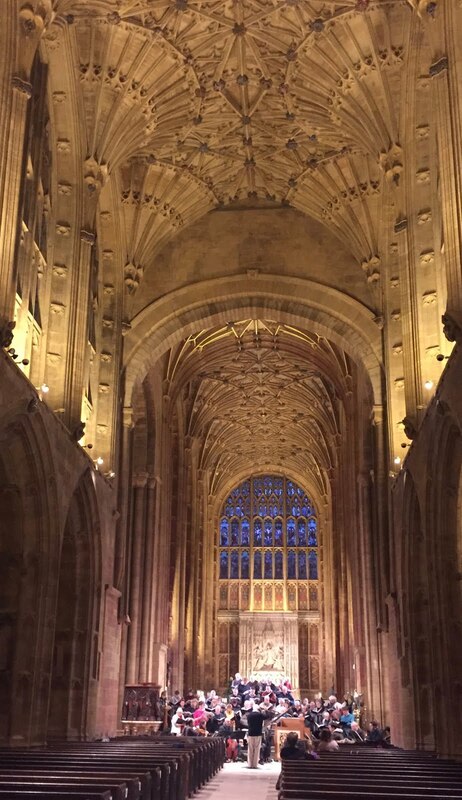 Sherborne Abbey was the magnificent venue for a concert entitled ‘Baroque Christmas’ on Saturday 5th of December 2015 at 7:30pm. The concert was given by the Sherborne Chamber Choir, the ensemble ’In Echo’ [founded by Gawain Glenton who is now a resident of Sherborne] and trumpet players from the Altenburg Ensemble. The advertising for the concert had invited the audience to ‘join us as we start the festive season off in Baroque style, with two joyous and colourful works from the early seventeenth century’ - and that is exactly what the audience heard! Paul Ellis conducted the performance of Schütz’ ‘The Christmas Story’ (in the first half of the concert). The ensemble ‘In Echo’ included two violins, two viols and violone as well as an excellent basso continuo section of organ and theorbo, and a team of wind players: one dulcian player, two sackbutt players and two cornettists. The trumpet section of five trumpeters and one timpanist performed in the second half of the concert from the rear of the church by the West end steps of the Abbey. The second half consisted of Michael Praetorius’ ‘Mass for Christmas Morning’, which was interspersed with various musical numbers and the audience/congregation participated in the hymns. The Altenburg Ensemble played an ‘Intrada’ by Johann Christoph Pezel after the Gradual hymn: ’Von Himmel hoch’ and played another fanfare by Bartholomäus Riedl after the communion motets by Praetorius ‘Wie schön leuchtet der Morgenstern’ and ‘Uns ist ein Kindlein heut geborn’. The final Recessional item was ‘In dulci jubilo’, which, for the first time in the concert, united all of the instrumentalists and singers, including the band of trumpets, still situated on the West end steps. The concert was a fantastic success and a glorious way to begin the festive season. "Praetorius’ Christmas Mass is a reconstruction of a Lutheran mass as it might have been performed on Christmas Day in Germany around 1620. Many of the main themes are familiar, having since been adapted into Christmas Carols, and in keeping with the style of the time there are a number of chorales for the audience to join in with, so do come ready to sing! The Schütz is a similarly colourful Baroque work written in 1660 narrating the story of the birth of Christ.